Suzhou previously transliterated as Su-chou, Suchow, is a major city located in the southeast of Jiangsu Province in Eastern China, adjacent to Shanghai Municipality. The city situated on the lower reaches of the Yangtze River and on the shores of Taihu Lake and is a part of the Yangtze River Delta region. Built in 514 BCE, Suzhou has over 2,500 years of rich history and relics of the past are maintained to this day. The city's stone bridges, pagodas, and meticulously designed gardens have contributed to its status as one of the top tourist attractions in China. Since the Song Dynasty (960-1279), it has also been an important centre for China's silk industry. It is occasionally dubbed the "Venice of the East" or "Venice of China". ● We only facous on Private/personalized tours rather than the large group tours as we gurantee our tour quality not the quantity. ● absolutely no any forced shopping places,when traveling with us, you will experience a REAL shanghai trip . ●Flexible and we hear what our customer needs and treat them from the heart. 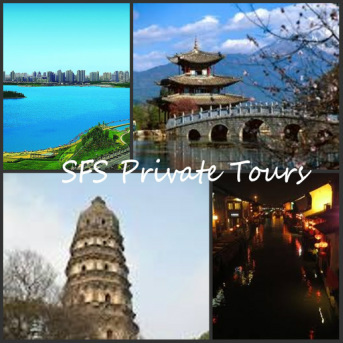 SFS offers various tours in and around Suzhou . We are also happy and flexible to tailor-made any unique tours to cater different customer needs. If you are coming as group travelers, private minivan/coach are also available, pls contact for detail quotes. The private guide will pick up you at your place/hotel then take the fast train to Suzhou( about 30 mins)- You will experience the most advanced train ride in China. The humble administrator’s garden: Covering about 52,000 sq. meters (12.85 acres), it is the largest and most renowned gardens and considered to be the finest garden in Sothern China. Due to its unique designs and ethereal beauty, the garden has garnered many special honors, has the same rank as summer palace in Beijing. It is also one of the gardens which have been listed in the world Heritage list. Suzhou No.1 silk factory: it shows a glamorized version of the history of silk, with little dioramas showing ancient silk production from the picking of mulberry leaves to feed the silk worms, to the actual weaving. It is good place to learn how the silk is produced. Tiger hill(Huqiu): It is famed as the first landscape in Suzhou , the famous Sony dynasty poet Sudong po said “ It would be pity if one visit Suzhou without visiting Huqiu”. It is the only one garden in Suzhou without ponds. And also the garden build on the mountain ( about 120 feet above the sea level , on top of it is the famous leaning tower , which has been witnessing the 2000 years history of Suzhou. It is also a good place to hiking and especially beautiful during the spring and summer time.